Another successful Maker Faire. At least for us. We didn't get as much done on the Locost as we wanted to beforehand, and of course by 'as much' we mean we didn't do anything. And just in case you think we're exaggerating and at least washed and waxed the car, nope, not even close. Oddly, no one seemed to mind. People still crowded around and stopped to stare at the car, and little kids still ran up and tried to pry every piece loose from it. We had our bright and shiny display board out, with colorful pictures and stories from the build, and everyone still ignored it. We never did get the bonnet painted. We just flat ran out of time. Plus, we didn't want to do it. Most people were kind enough not to say anything about it directly to our faces, but we did hear murmurs in the crowd. So maybe next year. 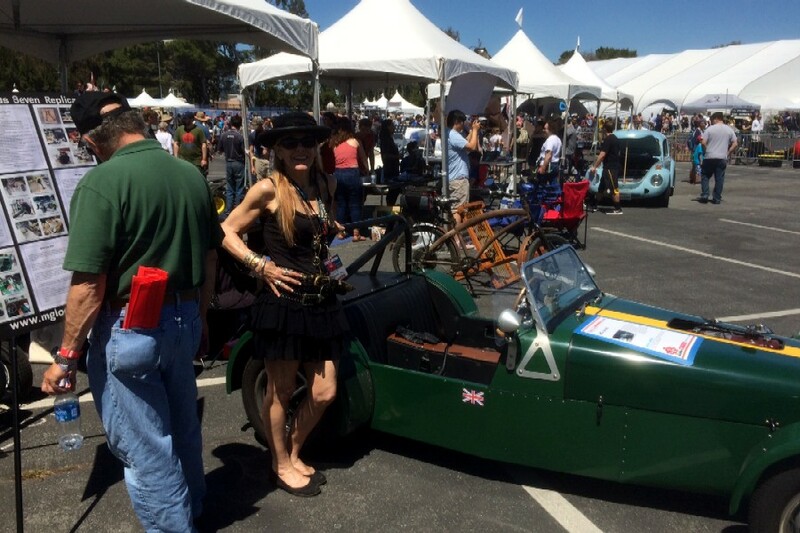 Meanwhile the usual critics were on hand to register their complaints, like for instance that the car wasn't electrically-powered, or wasn't fast enough, or took us too long to build and we should've started with a kit. But these were in the minority and we received a fair number of compliments on the car as well. Among our favorite visitors to our exhibit were those who were a) building their own Locost, b) planning to build their own Locost, or most importantly c) following our website. One enthusiastic young man turned out to be well into his build, had pictures to prove it, and as a bonus claimed to follow our website, although how anyone could read the tales of anguish and torment described in some of our earlier missives and still want to build a Locost is a bit of a mystery. Probably things are going a lot better for this young builder. They'd almost have to. Of course the big attraction this year was the junior Locost. At least for us. 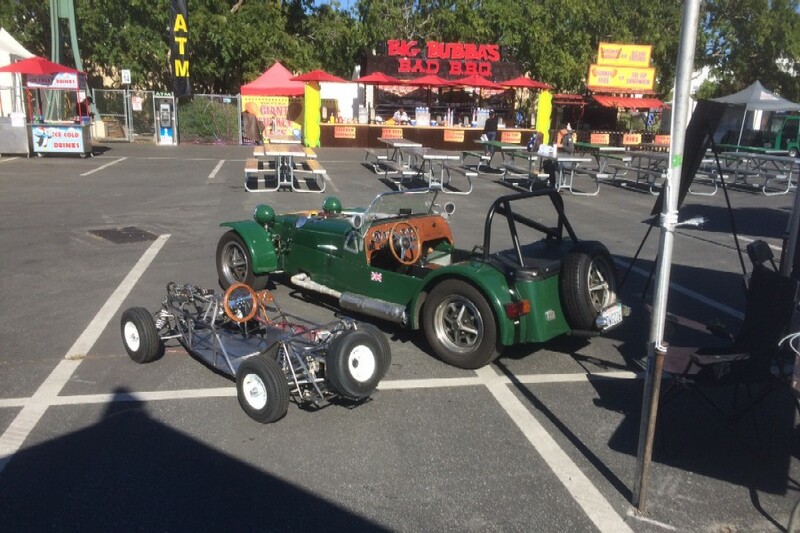 We arrived at the fairgrounds early Thursday morning with a rental car stuffed with the bare metal frame and eight big boxes of parts, just seven more than we needed last year to transport all of the parts for the wooden mockup, and by Friday afternoon we had a mostly drivable junior Locost rolling chassis. A quick test drive around the big parking lot confirmed we had at least some degree of control over the device, and we managed not to hit anyone despite the lack of brakes. Back at the workbench Saturday morning, we were pleasantly surprised to find how easy it was to install our brand new, out of the box MCP single-caliper hydraulic brake system. We were even more shocked when it actually stopped the car. 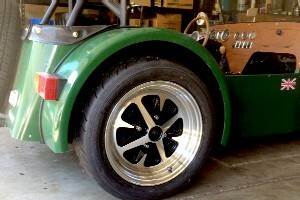 MCP brakes are popular among the go-kart crowd, but not famous for ease of installation. So obviously we got lucky. It does help that the brake lines are clear plastic and you can totally see the air bubbles moving through the lines when you accidentally let the master cylinder reservoir get too low during bleeding. But we got the brakes working, and with the car's ability now to 1) move under its own power, 2) change direction, and 3) stop, or at least slow significantly, the junior Locost was sent out to explore the local environs, clear the paths of foot traffic, drift through fast sweepers on the open parking lot, and chase down giant cupcakes. Our primary design specification for the junior Locost was to be faster than the cupcakes, and we met that objective handily. 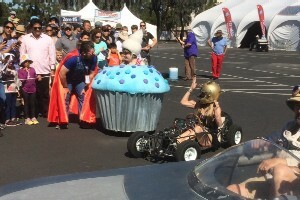 The cupcakes didn't quite know what to make of the little space frame sports car, but they mostly saw it from the rear. One design specification we failed to meet, or even specify, was the range of the batteries. Twenty minutes of racing through the fairgrounds slowed the little Locost to a fast walk, forcing it to limp back home to its charging station. A full charge took an estimated six hours, only an estimate because we never left it on the charger more than an hour or two, because there was always more driving to do. So we have to do something about the range, but not now. 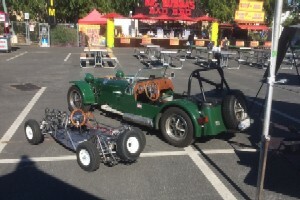 The Maker Faire is over and the junior Locost project is on hiatus for the summer. Back to the real thing. A few months ago we were excited to discover a manufacturer of Mustang wheels that looked exactly like MGB Rostyles, but made of aluminum alloy and actually round, instead of approximately round like our steel Rostyles. We immediately ordered one of the wheels to see if it would fit our Locost, and it arrived a few days later, looking even nicer than we imagined. Since that time we never did determine whether or not the wheel would fit our car, in part because that would involve mounting a tire on the wheel, which would involve paying someone to do it. The other reason for the delay was our vicious pace to ready the junior Locost for the Maker Faire. With that project now concluded, we decided this morning to take the Mustang wheel down to our local tire shop, along with a semi-used 195/50-15 Dunlop tire, and see what they could do with it. The resulting combination not only fit easily on our Locost, but looked amazing doing it. 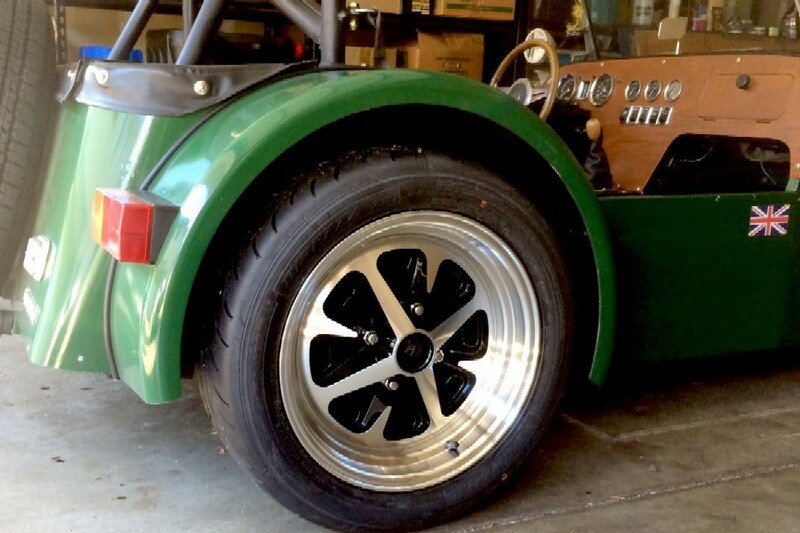 So we did the unthinkable, ordered three more wheels at a staggering cost, stretching the Locost budget beyond all recognition and leaving us with no money down the road for tires. But one thing at a time. For now we've mounted the one alloy in back as our spare tire, where it'll serve as a constant reminder of how poor we are. Fortunately, since we carry no tools in the Locost to replace a flat tire, we're not in any danger of accidentally mounting the spare on the car where it could get scuffed up or worse. When the new wheels arrive, we'll store them in the garage with the idea that someday the Altimax XP tires on the Locost will wear out, although after 30K miles of hard driving it's not looking good so far. Probably need to do more burnouts. Meanwhile the Locost is running flawlessly, based as always on our own definition of flawlessly. And running. Since rebuilding the carbs we haven't had to work on the car at all, which feels sort of odd, but we're not complaining. Not really. Obviously we'd still like to hook up the windshield wipers, and build a new exhaust system, and paint the bonnet, and possibly a few other things. But it's more important when the car is running this well to just enjoy driving it. We'll wait for the next breakdown to do anything serious.